Vegan Pretzel Bites (with Maple Mustard Dip) - First Edition First Aid Training Inc. The holidays are fast approaching which means that the quantity of friends and family gatherings is only going to go up from here! Grey cup parties, holiday gatherings, early Christmas gift exchanges… the list goes on! And chances are you will have to cater for many of them! One of the best ways to get out of making a time-consuming (and often expensive) lunch/dinner for many people is to serve tasty and filling appies! These can take the shape and form of many different delectable finger-foods and comforting snacks. Beside the typical veggie trays and fruit platters, are you looking to serve appetizers that still have some healthy ingredients? Why not choose something that will be tasty AND a better option at the same time? 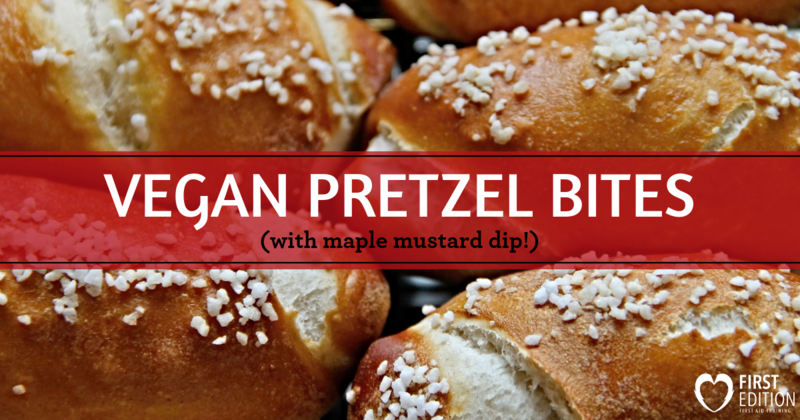 Your ultimate appie solution – Vegan Pretzel Bites with Maple Mustard Dip! Perfect to satisfy the cravings of kids and adults alike! Try out this delicious vegan recipe and serve it at your next and upcoming party! Boil the 5 cups of water with the baking soda. Cut the pizza dough in half, and then half again to work with small amounts of dough. Roll each amount of dough on a lightly-floured surface until it is about a 1-inch wide log-shape. Cut the dough into small 1-inch pieces, rolling each in your hands to form a small ball. Add these dough balls to the boiling water for about 30 seconds (or until the rise to the surface of the water) and remove from pot. Place wet dough balls on a pan lined with parchment paper. Sprinkle the coarse sea salt on top of the balls and use a knife to slit an ‘X’ on the top of each dough ball. Once all dough balls are boiled, salted, and sliced, put the pan in the oven and bake for 15 minutes or until the vegan pretzel bites are golden brown. While the pretzel bites are baking, mix all of the maple mustard dip ingredients together in a small bowl. Serve the warm pretzel bites and the maple mustard dip together.